Every round we play, and even when we have a bad round, we still usually hit a few shots that we actually tried to do. I had a 210 yd lie in the bark, under a big tree, with little trees in front of me, on the #1 hdcp hole. So I saw that I had a small window if I could hit a low rising cut of about 20 yards. But I had to take a smooth swing as I wore the old spike less ecco's, and the sparse bark on the hard dirt offered no sure footing. So out comes the 16* 3-wood, and I line up my feet to the opening, and aim the face at the pin. I make a smooth firm swing and absolutely nailed it. I ran out from behind the trees, just in time to see the ball land on the green and give me a 25' shot at a birdie, which I missed, but was still thrilled with the par. Mine was on the number 2 handicap hole - 178, into a 17 mph wind gust to 30, low 4 hybrid, intentionally to 4 feet. Rolled in the putt for birdie! Saved a round that was getting away from me!!! I was 280yd out on a par five. It was down hill down wind and took driver off the deck. Put it green side and got up and down for birdie. 430 yard hole pin back left water in the middle of the fairway lay up 243 to the leg 298 carry. I hit 7wd+7wd, pin high. 20 yards out side my distance range but I just crushed it. The very next hole narrow landing, water right, I ripped a 5 wd 240 yards. Most satisfied 3 shots of the rounds. It was a few weeks ago. Now ya cooking with Crisco! I was go hum today but had a whale of a day with my 3-wood, which is typically not a strong stick. Playing in a best ball tournament last Thursday, our group had 4 bad drives on a Par 4. The best shot we had, was my drive and we were left of the cart path in the thin rough and about 178 from the pin. It was also windy and we were playing into wind of about 15 to 20 mph. I pulled my 3 wood, choked up about an inch or so and took a 3/4 swing. It landed the green and stopped 12" from the cup. #8 was the signature hole of the match. Due to handicaps, I had to give a stroke since it's the hardest hole on the course. The wind was blowing hard left to right with OB down the right side. I started my tee shot on the intended line but it sailed away and ended up less than a foot from OB in deep rough. There was a tree just to my 11o clock. I was 157 from the hole and my ideal line would've been right through the center of the tree. I played a fade off the wind that missed hitting the right edge of the tree by inches. It landed in front of the pin then settled near the top of the tier ridge about 18 ft from the cup. I played it two balls to the left of the cup drained a fast downhill putt for birdie. Then Bill dropped a 10 ft par putt on top of it to halve the hole. Gotta tip your cap when guys do that. 53 foot par 2, I aced it. Was rolling on the back and 1 under when I skulled a shot of a trap leading to triple. The round could have slipped away from there. Howling wind into, left to right to a pin on the left top tier. 140 yards I watched three horrific shots before I got to hit. Pulled seven iron, never left the stick, pours my five foot birdie putt in the back of the cup. Nabbed a birdie on 18 for good measure. I did that last week, and missed the par as well. To my defense, the eagle putt was crazy downhill from 60 feet that I deemed impossible to put next to the hole, and still stay on the putting surface. I should have made the par though. I had I think 3 pars today. I did not have 1 birdie putting opportunity today, I played very poorly. However, on hole 11, I had 5 room from 200 down hill, with a downhill lie, so it should have been a push lie, nope, I hooked it horribly bad into the trees, with OB over there, it was a really really bad shot, It was so close to OB, there were 3 of us to verify. I had an opening to the green, leaves and pine straw and mushy ground was the lie I had about a 15 foot hill to go up and about 40 feet of green that sloped from right to left, so I had a chance to get it at least on the green, I played a low bullet into the side of the hill and it popped up on to the green and rolled and rolled and rolled, it stopped about a foot short, just a routine 4, no big deal. My round was awful today, but I had a couple good shots. Under clubbed or misread the speed? Mine was a 3 wood from 235 for my second on a par 5 on Friday. 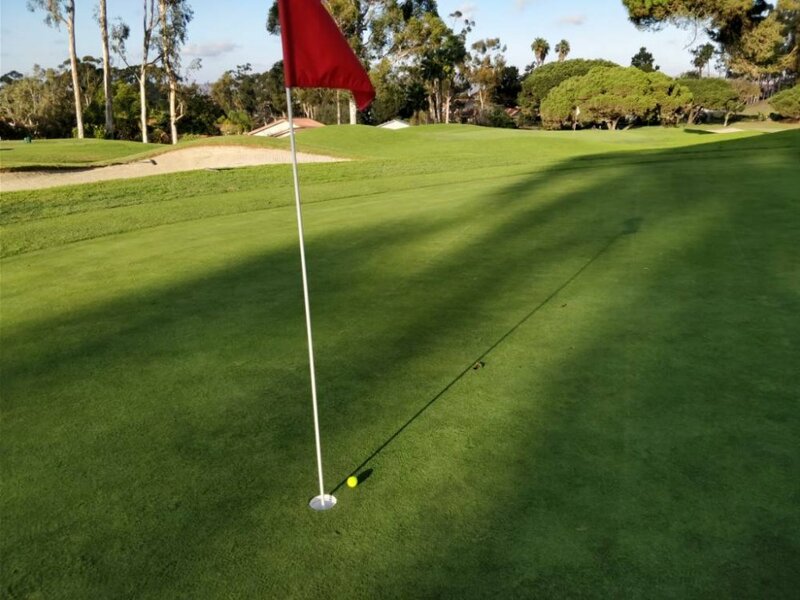 I hadn't played the course for 20+ years, and wasn't sure of the line due to a large mound in front of me. I jumped to try to see the pin, as a girl from the pro shop was driving past. She said, "Just put it on the green" as she drove off. As I walked off the last hole she drove past again, I thanked her for the suggestion. Of course, I left the 10 foot eagle putt 4 inches short dead centre. Par 3 13th, 140 yards. Water dips into the line just a little so it forces a carry if the pin is right. Pin right. Quit on the first shot, hit off toe, came up short, landed in hazard. Drop, then hit a beautiful second (third) shot 35 feet past and to the left of the pin with enough backspin that it trundled down the hill and took the slope coming back (my right) to the pin within 5 feet. Missed the putt and tapped in for double. It's one of the better shots I've ever hit because I played the backstop just perfectly. Need to do that more often.